The Florida manatee is a large mammal with a body that tapers down to a paddle like tail. They have two front flippers and every flipper has between three and four nails. The closest relative to the manatee is the elephant. 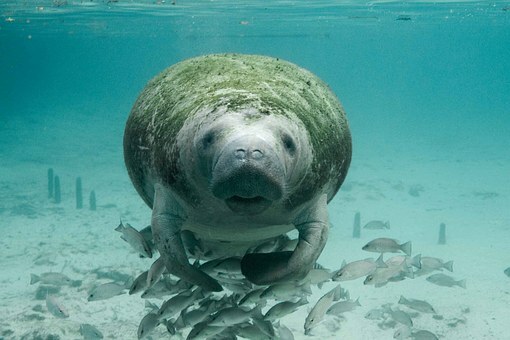 On average, an adult manatee is approximately 10 feet long and weighs 1000 lbs. You may find manatees in shallow water coastal regions, slow moving rivers and estuaries, mainly where sea grass beds or fresh water vegetation are abundant. Manatees are a migratory animal. In america, manatees are concentrated in Florida during the winter months and in the summer months, manatees may travel as far west as Texas, and north along the Atlantic coast to the Carolinas with a few having ventures as far north as Massachusetts. It is estimated that manatees can live as long as 60 years. They’ve no known enemies except for man and many human related deaths are caused by watercraft. In the end, the manatee’s loss of habitat is the most serious threat in america today. Mothers will nurse their young for between 1 and 2 years, during the time the calf will remain dependent on the mother.